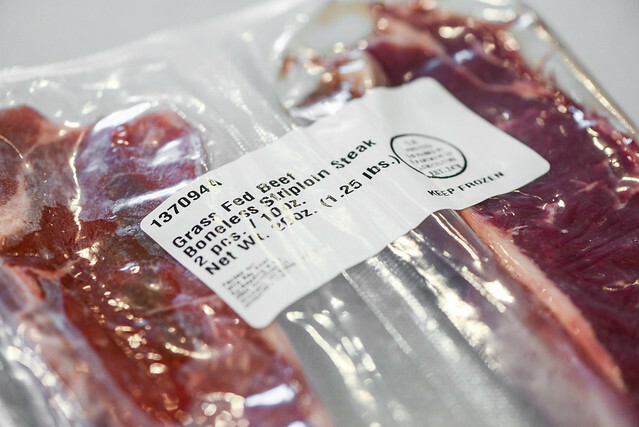 I had been a grass fed beef naysayer without really giving the stuff a chance until Wild Sky Beef sent a set of grass fed steaks to try out late last year. 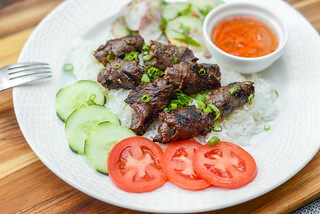 In my first foray into this lean meat, I lamented a bit the loss of the beef fat I so love, but also took note of the unique and heightened flavor of the meat itself. 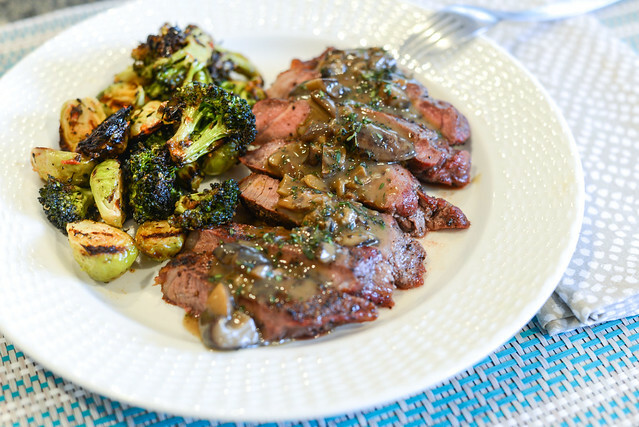 I had paired those ribeyes with a fresh lemon and herb butter sauce, but I felt like the slightly gamier character of the meat would have been better matched with a hearty, more savory sauce, like mushroom gravy. So when it came time to cook my next pair of steaks—this time going for the strip loins—I acted on my matchmaking instincts and I can happily say that it turned out to be a very harmonious union. 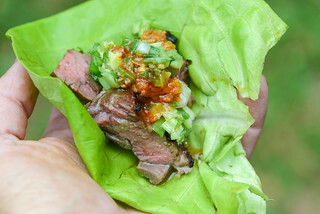 No longer a true grass fed novice, I knew how to correct some of the issues I had from the first go round. Most of it involved proper cooking, as the combo of very little intramusclar fat and a relatively thin, one-inch thickness combined to make a steak that cooked faster than I was used to. 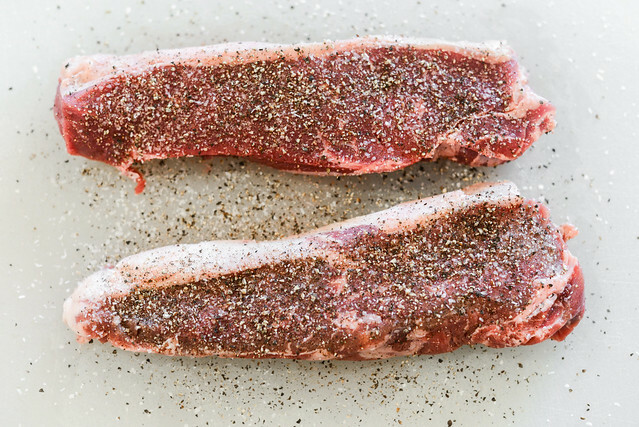 I started these steaks out as I would with any—with a generous seasoning of salt and pepper. I always do my salting of the steaks at least 40 minutes prior to cooking. This is the minimum time needed for the salt to do its magic of drawing out moisture and then reabsorbing it, leading to better moisture retention and overall flavor. If I'm seasoning less than an hour ahead of time, I just let my steaks sit out at room temperature, otherwise I'll stick them back in the fridge if it's going to be a longer stretch of time until they're cooked. 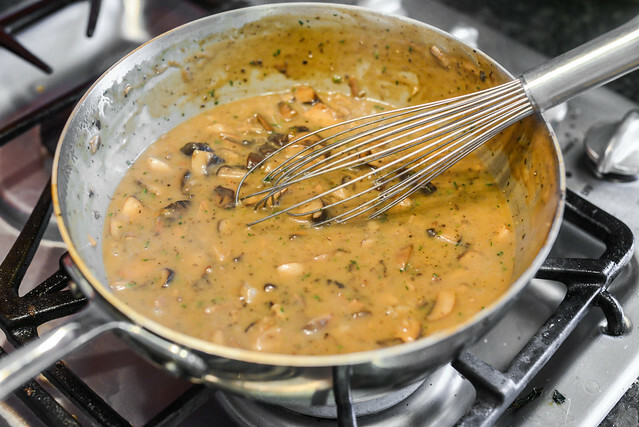 The mushroom gravy I used here was a recipe I developed a long time ago and have come back to a few times to continued great results. This gravy is incredibly savory with a deep woodsy mushroom flavor, and I pin a lot of those ideal qualities on the use of dried porcinis. 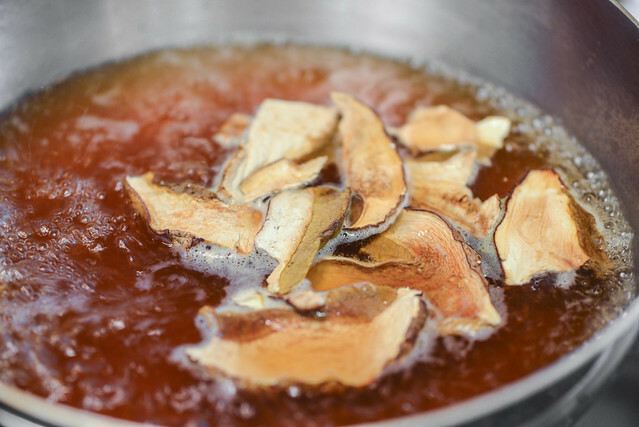 I find soaking these rich mushrooms in the stock that will be used to form the gravy embeds the liquid with a strong mushroom flavor from the get go, and it's always good to start things off on the right foot. Of course, a buttload of other mushrooms helped too. I used a mix of cremini and shiitakes in my recipe, but you can really use your mushrooms of choice here. The main idea was to get a complex and varied mushroom flavor by both quantity and variety. 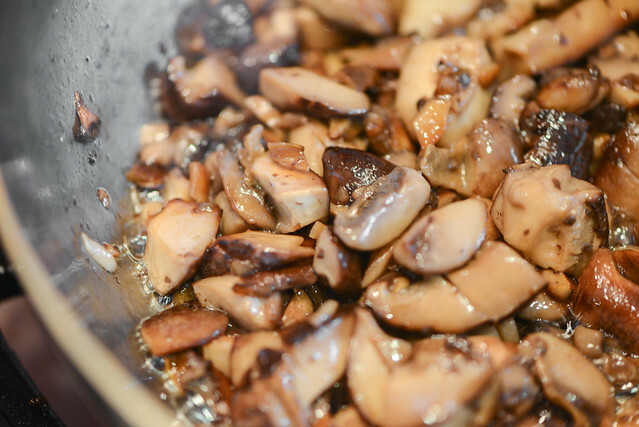 To get the most flavor from the mushrooms, I cooked them until they released their liquid and then started to brown. At which point I added in flour and cooked it for a minute until it lost its raw aroma. Then I whisked in the mushroom-infused stock and let the gravy simmer until slightly thickened. I then finished it up with a bit of dry sherry, fresh thyme, and salt and pepper to taste. This gravy turned out as rich and delicious as I remembered it and couldn't wait to see how it went with the steaks. For the steaks, I used the reverse sear method to achieve the most even cooking with the juiciest results. This started out with roasting the raw steaks over indirect heat, which usually takes a bit of time and I'm used to being able to safely step away from the grill this step. This was my main folly in my last go round with grass fed beef—I went inside to photograph my side dish and by the time I came back, the steaks were already twenty degrees past the temperature I wanted them at. So this time I sat next to the grill, checking the temp every few minutes to be safe. 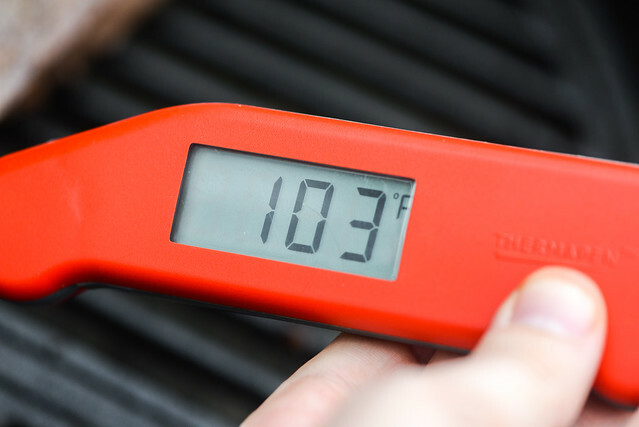 I was shooting for no more than 105°F, since I wanted my final temperature to be around 125°F for a good medium rare. Once I saw these steaks were close to my target, I moved them over to direct heat. Now that the beef was already cooking for awhile, the exterior of the meat had lost a lot of moisture, which was great for getting a good sear on the steaks as fast as possible. While searing, I was flipping the steaks about every 30 seconds or so for more even cooking, and with each flip, I also took a read on the temperature. I like a deep, crusty sear, but the steaks reached their final temperature before that could happen, and I decided juicy meat was more desirable than a deep sear, so pulled them off to avoid overcooking. After resting for five minutes, I sliced into the steaks and was greeted by both a beautiful rosy red color almost from edge to edge, along with a ton of juice. My previous grass feds had the nice color, but lacked that glistening look, so I was much happier this time knowing I righted a wrong. I couldn't wait to dig in, but after spooning on the gravy, my enthusiasm turned to frustration as I couldn't figure out a quick way to make these look really good in a photo. I didn't want to take so long that the steaks got cold though, so eventually just gave up and figured it was all good, especially since "ugly delicious" is so hot right now. And delicious they were. That gravy had such an amazing richness and savoriness to it that was hard to stop eating it by the spoonful when taste testing it, but it was even better when paired the strong meaty flavor of the grass fed beef, whose own juiciness really didn't need a crutch. Still, the two were a perfect match in my opinion, and I think this second attempt at grass fed steaks is proving to me that I'm understanding the unique cooking qualities and flavor much better than before and am looking forward to whatever I come with for next couple batches of steaks I still have sitting in the freezer. 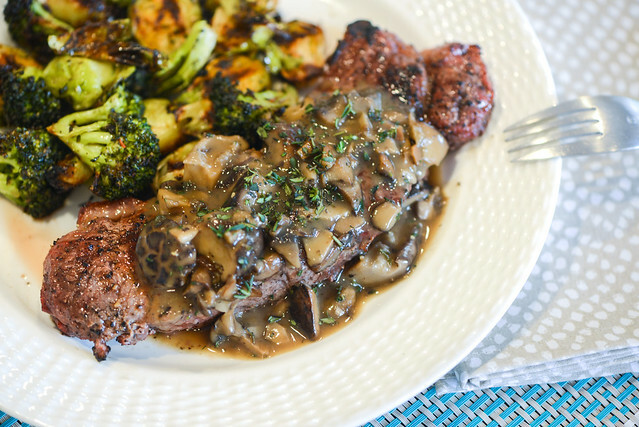 A super savory and rich mushroom gravy pairs great with beefy strip steaks to make one incredibly delicious, albeit not the prettiest, meal. 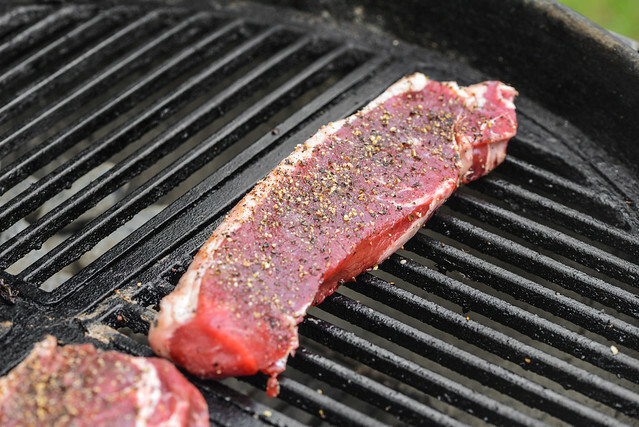 To prepare the steaks: Season steaks liberally with salt and let rest at room temperature for 40 minutes. To make the gravy: Bring stock to a boil over medium high heat in a medium saucepan. Remove from heat and add in porcini mushrooms. Let steep until mushrooms are tender, about 15 minutes. Drain mushrooms, reserving stock. Roughly chop mushrooms. Melt butter in medium saucepan over medium heat. When foaming subsides, add porcini, cremini, and shiitake mushrooms and cook, stirring occasionally, until browned, about 10 minutes. Add flour and cook, stirring constantly, for 1 minute. Slowly whisk in reserved stock. Bring to a boil, reduce to a simmer, and cook until gravy has thickened and reduced to 3 cups, 10 to 15 minutes. Stir in sherry and continue to cook until warmed through, about 1 minute. Add in thyme and season with salt and pepper to taste. Set aside. Light one chimney full of charcoal. When all the charcoal is lit and covered with gray ash, pour out and arrange the coals on one side of the charcoal grate. Set cooking grate in place, cover grill and allow to preheat for 5 minutes. Clean and oil the grilling grate. 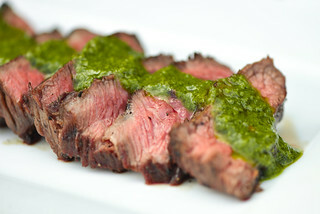 Place steaks on cool side of grill, cover, and position top vent over cool side of grill. 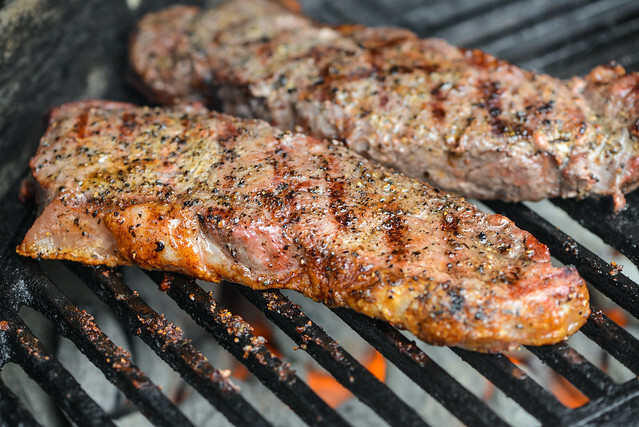 Cook steaks, flipping every 3-4 minutes, until center of steak registers 105° on an instant read thermometer. Transfer steaks to hot side of the grill and cook, flipping every 15-30 seconds, until well seared and center of steak registers 125° on an instant read thermometer, about 2 minutes. 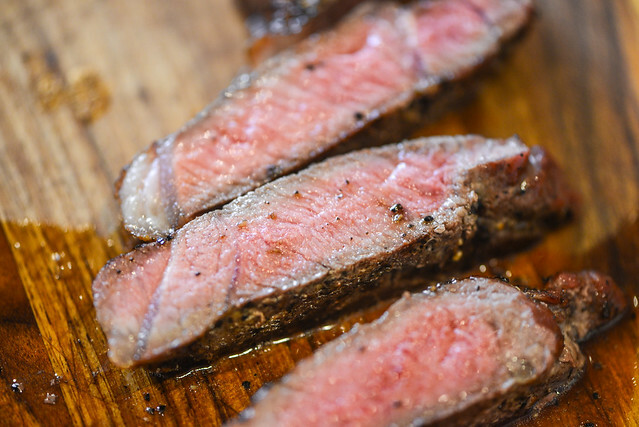 Transfer steaks to a cutting board and let rest for 5 minutes. Reheat gravy while steaks rest. Slice steaks, top with gravy, and serve immediately.